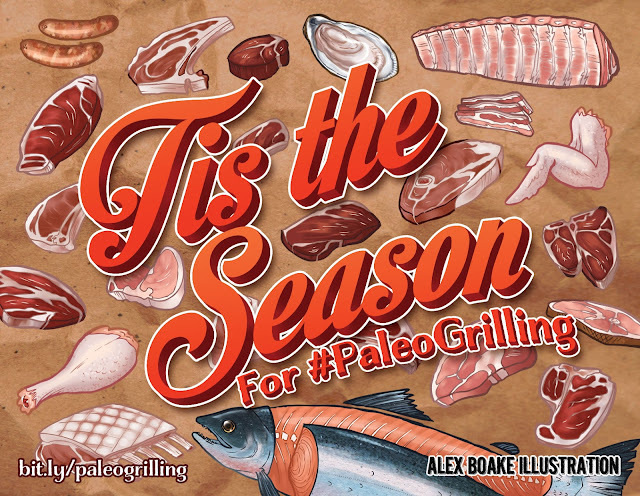 Home / Uncategories / Tis the Season for Paleo Grilling! Tis the Season for Paleo Grilling! Last year, my cookbook, Paleo Grilling: A Modern Caveman's Guide to Cooking with Fire, was released and honestly I had no idea how it was going to be received. I had partnered with a local chef, Jay Phelan, and knew that the recipes were off the charts, but after spending weeks in front of the computer typing everything into Google docs, reviewing mock-up pdfs, and fretting over every detail, I had lost my ability to be objective. It wasn't until that first printed copy arrived at my doorstep that I was able to breathe a sigh of relief, everything had come together better than I expected, the rest was out of my hands. Paleo Grilling was featured on Jeopardy! I was invited to be a co-host on Camille's Paleo Kitchen! I flew to New York to film an episode of The Better Show! I drove to Charleston to film a segment on Low Country Live! My local TV channels had me on... multiple times! Our "Caveman Cue" BBQ sauce won 3rd place in the Paleo Magazine Reader's favorites awards! 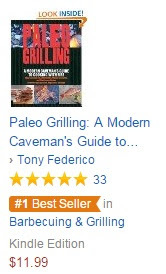 And Paleo Grilling is STILL rocking the charts on Amazon.com! If you haven't checked Paleo Grilling out yet, I hope you do, it's full of recipes that are perfect for both everyday occasions as well as epic parties. You'll be surprised at how much you can do on a grill! And even beyond that, I spent a lot of time diving into the history of cooking, the importance of sourcing quality meat, and how to get started with the right grilling equipment. "Honestly I am not familiar with the Paleo diet, my first thought, oh great another diet cookbook. I had to Google Paleo to see what I'm dealing with. In simple terms.....back to basics.....no processed food. I'm sure it's a lot more than that, but that is what I got out of it. This book is much more than that. It starts with the meat, which peaked my interest I've been seriously rethinking where I get my meat. I want to know where it's coming from and I don't mean the market but the farm/ranch, Paleo Grilling addresses this and resources. Next is a section on grills, tools, pantry and meat cuts. On to the recipes, there is a very nice selection of sauces, rubs and marinades. As I go through the pages I am really loving the no processed food. One marinade that caught my eye is the Asian Pear BBQ Marinade. Flipping through this book, I'm placing flags on almost every recipe. Mojo Pork Shoulder, Pulled Chicken Stuffed Peppers, Grilled Swordfish with Jicama Mango Slaw, Grape Leaf - Wrapped Grilled Trout, Citrus Grilled Quail, Double Bacon Bambi Burgers (snickering as I'm typing this watching 3 deer walked across my backyard) and dessert is not left out of this cookbook Chunky Chocolate Banana Pops, Watermelon Mojito Freezer Sorbet. Eating healthy just got exciting."